TaxiForSure founders Raghunandan G. (right) and Aprameya Radhakrishna. Mumbai: Over the previous 18 hours, Raghu, as he is popularly known, had practiced the speech, playing the sentences over and over again in his head. He would start by saying that in the three-and-a-half year journey of TaxiForSure (TFS), he had never thought that a day like this would ever come. That he had never planned for this. That it was the worst moment of his entire TFS journey. Now that the moment had arrived, at around 2.30pm on a warm March afternoon, at TFS’s office in Bengaluru’s Koramangala, on the terrace, in front of almost 200 nervous employees, Raghu was overcome by emotion. He gave himself a few seconds to recover. And then a few more. The previous 18 hours had been tough. He had barely slept, knowing what was around the corner. Monday had started way earlier than usual. He woke up at 5am but there wasn’t much to do, so he idled around and, then, when his two-and-a-half-year-old son woke up, he made him breakfast. At about 7.30am, Raghu and his wife, Shilpa, left home. Their destination was TFS’s first office—the company had started here in 2011 with just two people—Raghu, 33, and Aprameya Radhakrishna, 34. It was a 100 sq. ft terrace office; No. 855, 4th Floor, 7th Main, JP Nagar, Bengaluru-78. Does eBay have a sweetheart deal with Snapdeal? At around 8.15am, when Raghu and Shilpa reached the office, TFS’s finance controller Deena Jacob was already there, waiting for them with a clutch of documents. It was Raghu’s idea to meet there—to see the end of TFS’s journey from where it had all begun. Before he got down to it, though, Raghu had to honour a simple request from Shilpa—he could sign the documents only after 9am, at an auspicious time. The group whiled away the time, fondly recollecting old memories, making plans to buy the 100 sq. ft room as a keepsake. Once the clock struck 9, Raghu got down to it. One after the other, he signed 16 copies of shareholder agreements, all stating that he was okay getting in Ola Cabs as a 100% investor in the company. The 16 slight scribbles brought closure to months of helplessness and frustration. And just like that, TFS was sold to Ola Cabs. This is the story of two entrepreneurs who set out to build a big business (after a drunken night at the Tavern pub), couldn’t, and so cashed out and moved on. It is the story of TFS’s oversized ambition, a black swan event, a government’s knee-jerk reaction, cash burn, over-reliance on venture capital funds and life in the times of Breaking News media coverage. This is the story of how, in just two months, TFS went from a prospective good second bet in the taxi aggregator business in India, almost on the verge of raising $200 million, to a company that no venture capitalist would touch. It all started when Ola Cabs (the company’s name is ANI Technologies Pvt. Ltd) turned up the heat—on 22 August 2014. It was a business-as-usual move, a competitor trying to score a quick win, about getting the numbers up, sharply, just before stepping out to raise funds. And so, on a cool Bengaluru morning, Ola Cabs dropped Ola Mini cab rates by almost one-fourth, from ₹ 13 to ₹ 10 a km, making cabs cheaper than an auto rickshaw. The fare for an Ola sedan was slashed from ₹ 16 to ₹ 13 per km. And that was only for the consumer. For drivers, Ola started a weekly incentive scheme—a driver who did 30 or 40 trips a week could earn as much as ₹ 8,000 as a bonus. In September, Ola changed the driver incentive scheme once again—to a daily one. A driver who did five trips a day would get a bonus of ₹ 500, seven trips, ₹ 800, 10 trips, ₹ 1,200. Then came the Ola Wallet and a promise of 100% cashback, on the first recharge for every user, till October 2014. Ola’s rival, across town, TFS, was watching the firm’s every move closely. Ola’s logic was clear. The company had raised ₹ 250 crore in a round of funding in July 2014 and was burning money to get more customers and drivers on its platform. In the process, it was losing as much as ₹ 200 on every ride. “We thought it would not last, that it was just a spike," says Raghu. “The daily driver incentives given by Ola had started affecting us because, at the end of the day, a driver has both devices and will choose whoever gives him more money. So we waited for September and October to see whether Ola would stop." TFS was confident that Ola would. The company couldn’t have been more wrong. On 28 October, Ola raised $210 million (about ₹ 1,281 crore) from SoftBank Internet and Media Inc. (SIMI) and its existing investors—Tiger Global, Matrix Partners India and Steadview Capital. “We never expected that someone would write a $210 million cheque for a cab aggregator company in India so soon," says Raghu. “With that kind of money on the table, Ola would not stop. That’s when we thought we couldn’t just be on the sidelines and watch. That we would have to fight for our survival." In the start-up world, whenever there is a large difference between two firms, raising capital becomes very difficult for the laggard. 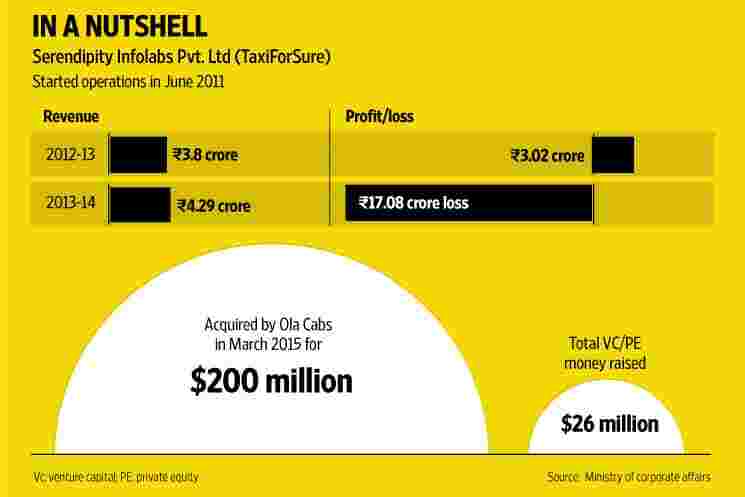 With $210 million at its disposal, Ola had serious potential to outrun TFS. So if TFS had to survive, it needed to grow. And then, because it had only so much cash in the bank ($8-10 million left, part of the $12 million TFS had raised in August 2014 from Accel US), it had to get into the market to raise another round, a big one. On 1 November, TFS decided to play the game. It came up with a simple strategy. Thanks to the higher per km rates, consumers weren’t using the service for short distance travel. So, at the consumer end, TFS dropped rates. To ₹ 49 for the first 4km and then ₹ 14 per km. But at the driver’s end, it needed to incentivize drivers to pick up rides. So it held on to the old rates for drivers ( ₹ 200 for the first 10km). So if a customer was paying ₹ 49 for a 4km run, the driver would still receive ₹ 200. To put it simply, TFS was losing ₹ 150 per ride. But the strategy worked brilliantly. Almost immediately, there was a significant surge in the number of transactions. By the end of October, TFS was doing about 8,000 transactions per day without losing any money. By the second week of November, the number of transactions had jumped by almost three times. And so did the losses. On an average, TFS was losing ₹ 36 lakh every day. In November, TFS burnt through $1.8 million (almost ₹ 11 crore). If that wasn’t enough, the firm started expanding to other cities. It entered Hubli, Ahmedabad, Mysuru, Kolkata and Chandigarh. The way Raghu and Aprameya saw it, it was a do-or-die strategy. “You can be conservative," says Aprameya, the co-founder of TFS, “but once you get aggressive, then you go for the kill. Maximum growth, maximum cities, all positive signs." Sometime in the third week of November, TFS started exploring the market to raise funds—around $200 million. Things looked good. In early 2014, skeptics had questioned the size and scale of the Indian taxi aggregation business, but with SoftBank’s $210 million investment in Ola, almost overnight, the market was validated. Everyone agreed that it was a multi-billion-dollar opportunity. Private equity and hedge funds in the US and Hong Kong were excited. “We were bleeding," says Raghu, “but we took a call to get aggressive. We saw a 4X jump and our investors were so happy. It was amazing. So many investors were interested in participating. And everybody was telling me, this is amazing Raghu, this is great. We can put in a large sum of money." Over the next couple of weeks, talks between TFS and prospective investors progressed smoothly. The company saw interest from more than 20 investors in the US. Due diligence and number crunching had already been done. Only two steps remained; a partnership meeting with the firm, where the entrepreneur makes a presentation to the firm’s senior team, and the final nod for investment. Usually, entrepreneurs like to do this face to face. With that in mind, on 6 December (a Saturday), at about 8.30pm, Raghu boarded an Etihad Airways flight from Bengaluru to San Francisco. Only when he landed in the US, on Sunday morning, and connected to the airport Wi-Fi, did he realize that while he was on the flight, an incident with dire implications for the taxi business had taken place in India. Late in the evening, at about 11pm on 6 December, news broke that a Uber cab driver, Shiv Kumar Yadav, had raped a 26-year-old woman passenger in Delhi. Once Raghu reached his hotel, he got on to a call with Aprameya and the senior management team from TFS to discuss the Uber incident. In Delhi, things looked grim. There was widespread anger and the air was rife with rumours that all taxi aggregator firms would be banned. Other states, too, such as Karnataka and Maharashtra, were considering a ban. The news of the ban was circulating on social media, but TFS hadn’t received any notice. Back in San Francisco, Raghu started feeling the pressure. He had lined up almost 20 meetings with VCs and hedge funds the following day, Monday, 8 December. He didn’t want to go in unprepared. So he asked for a breakfast meeting with Arun Mathew of Accel US and Ashish Gupta of Helion Ventures. They met, first thing Monday morning. “And they were like, it has become a big thing," said Raghu. “Everybody in the Bay Area is discussing this, and just this. That’s when Arun told me it was a really bad time for me to visit because most talks would be on the Uber incident." Mathew was right. Raghu’s first partner meeting was at 8.30am, and this is how he remembers it going. First question: What do you think about the Uber incident? Second question: What will happen to Uber? “I was like, this is the heat of the moment...," Raghu replied. “Over a period of time, things will settle down. I think, in some part, Uber will have to make some changes in its business model, and stuff like that. But it doesn’t mean things will get eliminated, it is an essential service." Third question: Have taxi aggregators been banned? Fourth question: What does the law say? Fifth question: Why have you not taken permits? “I told them we had not received any notice," says Raghu. “It is not a banned service, as long as the regulations governing aggregators are absent. It is a new model, and the government hasn’t thought about this." The partners didn’t share Raghu’s optimism. In their mind, regulation was top priority, and they needed more time to figure it out before committing to investing. Over the next five days, every meeting, 23 in all, Raghu had followed a similar script. Even as all this was happening, back in India, Aprameya was facing the music of a government that was desperate to be seen as doing something. In a knee-jerk reaction, it wanted to ban the service. On Tuesday morning (9 December), Aprameya got a call from the Bengaluru police commissioner to come for a meeting at 11am. Most cab operators were there, except Uber. “They made me stand up and asked me, what is your model? Do you take responsibility?" says Aprameya. But, before he could answer, someone behind him quipped: “Sir, on their website, they are saying they don’t take any responsibility." As Aprameya tells it, the commissioner was furious, and it felt like being back in school, being reprimanded by the teacher. The same day, news appeared that the home ministry had banned Uber and all other taxi aggregators in Delhi. But there was nothing in writing. “Till date, we have nothing in writing saying we are banning you," says Aprameya. But public sentiment was against the aggregators, and they couldn’t make a statement about not actually being banned. TFS was helpless. It wanted clarity, but couldn’t get any as there was no formal paperwork. “The media said the home ministry has banned the service but we were working with the transport ministry. They were saying an internal memo has been sent. So there was no clarity." Back in San Francisco, Raghu decided to wait it out another week. And seek fresh meetings with VCs who had Indians in their management, with the idea that perhaps they would understand the regulatory flux in India better than the Americans, for whom absolute clarity on regulation was top priority. But, even in those meetings, nothing changed. “It was sheer bad timing," says Raghu. “I wasn’t frustrated because I could understand their concern. But there was disappointment." Raghu could have stayed longer, but the holiday season was about to begin. On 21 December, he got back to Bengaluru. He had no money but assurances from a couple of investors, who were keen to sync back after 7 January, when they would be back from holidays. Back in India, things hadn’t changed much. There was no regulatory clarity in Delhi or Chandigarh, where there was supposedly a ban. “The funny thing is we didn’t stop operations anywhere," says Raghu. “Because we didn’t have any notice. It was only in the news." In the second week of January, things became difficult. The firm was losing money every day and it just couldn’t stop the incentives. The investors who had promised hope after 7 January got back and said they were unsure. And the existing investors were not in a position to bring in money. “It needed a big guy to come in and write that cheque. It was a lot of money," says Raghu. On 10 January, two of Accel India’s partners, Anand Daniel and Prashanth Prakash, asked Raghu and Aprameya out for coffee; 30 minutes into the meeting, the Accel partners broached the subject of an interest from Ola Cabs. “So why don’t you guys consider this? It is something we can explore," said Daniel. “In the meantime, if there is inbound interest from a large player (fund), that can also be considered." It wasn’t an easy discussion to be had. Raghu says that his first reaction was ‘no’. “We said that as founders, we wouldn’t want to sell to competition," he says. On their part, Daniel and Prakash argued that on the face of it, Accel was interested in talking with Ola but that it was not their decision to make. “They have approached us and we think it is our responsibility to come and tell you guys. So you guys decide," said Daniel. The meeting lasted about two hours, after which both Raghu and Aprameya went back to office. Once inside the boardroom, they frantically started putting together the names of the investors that they could reach out to at short notice. They were going to ask for some money to “weather the storm to survive", says Raghu. They cut down on the amount of $200 million. On a piece of paper, Raghu put down 14 names. And over the next few days, he began calling each one of them. It was a futile effort. TFS had very little money left, and absolutely no time. The company had less than $2 million in the bank, which would have lasted only till mid-February. “We ourselves were not convinced (that we would survive)," says Raghu. “I called all the 14 people, and we even convinced two to participate; but it was too little, too late. We could have survived only for two-three months with that kind of money." After a while, pragmatism won. The firm couldn’t afford a scenario where there would be no money to pay the salaries of the 1,800 employees. Or worse, pay operators. Between 15 and 20 January, the promoters realized selling out to competition was probably their best option. “That’s when we reached out to our investors to reach out to Uber and also began talks with Ola," says Raghu. Even as all this was happening, on the morning of 28 January, The Times of India ran a story, citing people it didn’t name, that Ola Cabs would acquire TaxiForSure. For $200-250 million. The story said it is a “sealed deal and could be announced in the next few weeks". Raghu claims the deal was far from being sealed as TFS had just begun talks. And not just to Ola but also Uber. For the outside world, it didn’t matter. At TFS’s office, all hell broke loose. “You know, 28 January was so miserable," says Raghu. “I walk into office and see Monster.com and Naukri.com pages opened on some of the employees’ monitors. It is an open office, and you feel so bad. And you can’t walk up and say anything. And people are also not going to come up and ask." Over the next few days, the cross talk among employees increased, so did the speculation. “For a few days after that, people would just leave at 6pm. We’ve never seen our office empty at 6," he adds. Previously, on 20 January, the firm had “capped marketing expenses and put a freeze on hiring. So now, people started co-relating and jumping to conclusions". It wasn’t long before the taxi operators started dropping by. Curious to know what’s happening because their livelihood depended on TFS’s existence. Aprameya and Raghu were helpless and frustrated. “We believed we are open and transparent," says Raghu. “So now what? How do you hold that belief? Some people felt they are getting cheated because they are getting to know things from the newspapers. That phase was really bad—where we had no answers." It is another matter altogether that concern over the future of the employees was playing on top of their minds in seeing the deal through. And to solve that piece of the puzzle, Raghu turned to Phanindra Sama, the founder of Redbus, for advice. Sama had made a successful exit in 2012, when he sold Redbus to Ibibo, but the exit hadn’t gone as well as Sama would have liked it to. In the first week of February, Raghu and Sama met at a Café Coffee Day outlet in Indiranagar, at 5pm. Raghu had a simple question for him: what are the mistakes he could avoid? Or what is it that Sama would do differently, if given a chance? It was then that Sama shared an interesting anecdote with him. Something that took place after Redbus was acquired by Ibibo. When an employee walked up to him and said: “Phani, just like you, we also gave our blood, sweat and tears for the firm. So why is it that you are the only one making money?" So Sama asked him, “What is it that you want?" And he said: “One month’s salary as bonus will do." “That’s what Phani told me," says Raghu. “That if at all, you should give one month’s bonus to all the employees. And I was like, okay, if that’s the case then why one month, we will give two months’ bonus." That’s how equity stock option (ESOP) acceleration (for TFS stockholders) and two months’ bonus for about 1,800 people became the centre of the conversation and negotiation with Uber and Ola. With Uber, the discussions went far, before a scary reality emerged. The company globally has 848 people on its rolls. TFS had 1,800 people in India. If the deal was to go through, it would lead to a massive bloodbath. “That’s where we closed it," says Raghu. “So product, engineering, marketing, analytics, and tech, Uber has its own thing. And also Uber believed only in a driver-led model, so our operators (people who own and run a fleet of cabs) would also go. So it would have been a bloodbath and 90% of our people would have had to go. That’s why we said no." After that, it was just Ola. And Bhavish Aggarwal, the founder of Ola, agreed the company would continue to work with operators, and also ensure that none of the people in the team would lose their jobs. Towards the end of the meeting, Aprameya wants this writer to take a guess on how much money TFS raised in its three-and-a-half years of existence. $26 million till December last year. The $10 million after that, the bridge round was just for the deal to happen. Aprameya says the firm didn’t respond or acknowledge a report in The Times of India on the last round being $30 million. “It is good for us if people are quoting a higher number." He continues: “We raised $26 million and sold for $200 million... That’s 1/9th of what Ola has raised. And Uber has already pumped in a lot of money—at least five times more than that. We were doing 40,000 transactions a day with that money. You know it would have required one more guy in the world to say, ‘Yes, we will fight SoftBank’. It never happened, but that’s okay." It is evident that luck and timing haven’t exactly gone TFS’s way. Raghu says it is about circumstances. “We were lucky to have lived this journey and made a respectable exit. From a personal ambition, vision and goal, yes we were unlucky. But it could have been worse. Much, much more worse."